Follow the progress of your broadcasts in realtime! Know immediately whether voice calls were answered or went to voicemail, how many were busy, and which texts were sent successfully. Don't wait for a call from a representative or an email notification that your broadcast was run. At any point in time, you can see exactly how many of your messages have been sent, how many were answered, how many were busy. 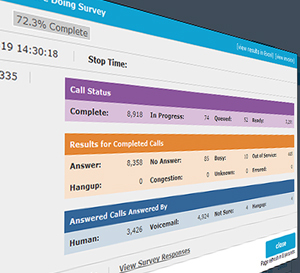 We provide extensive results for the entire broadcast and detailed results for each call. We can also export your results to an Excel spreadsheet, so you can create charts or perform more sophisticated analyses on the data.